Wouldn’t it be super neat if you could eat a certain food and it would transport you to the place of its origin? Like if this Caribbean jerk chicken transported me right to a sunny Caribbean beach. That would be just super neat. Just so super duper neat. Just so very — but OH HAI REAL LIFE and your lack of sunny Caribbean beaches. 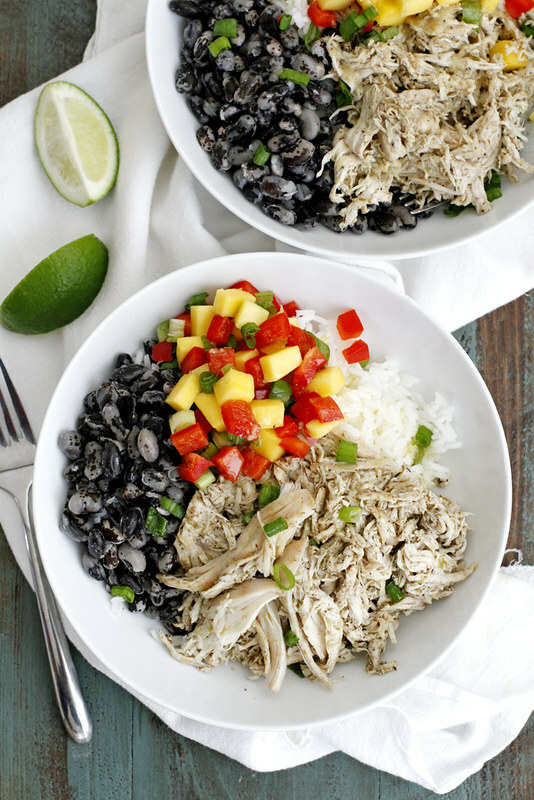 Real life may not be so super neat, but at least it still includes these tasty, filling and healthy chicken, bean and rice bowls. And I suppose that will suffice (for now). What is also real life, however, is that I actually am going on a trip! It may not be to a sunny beach, but it is to a place where I hear the beer and the chicken and waffles situations can’t be beat. The husband and I are headed to Asheville, North Carolina this week for our first baby-free vacation since, well, baby. And while we are THISEXCITED to go, we are also a little bit nervous/anxious/sad about leaving the little one behind for a few days. So I’ll probably be drowning my sorrows in beer/maple syrup on my chicken and waffles. And because I’m expecting to eat and drink as many chicken and waffles and beers as one can possibly handle (you’d be surprised how much that is for me), I’m bookending each side of the trip with this healthful bowlful of chicken, bean and rice goodness. The chicken is marinated in a sweet-spicy Caribbean jerk rub, then baked and shredded. 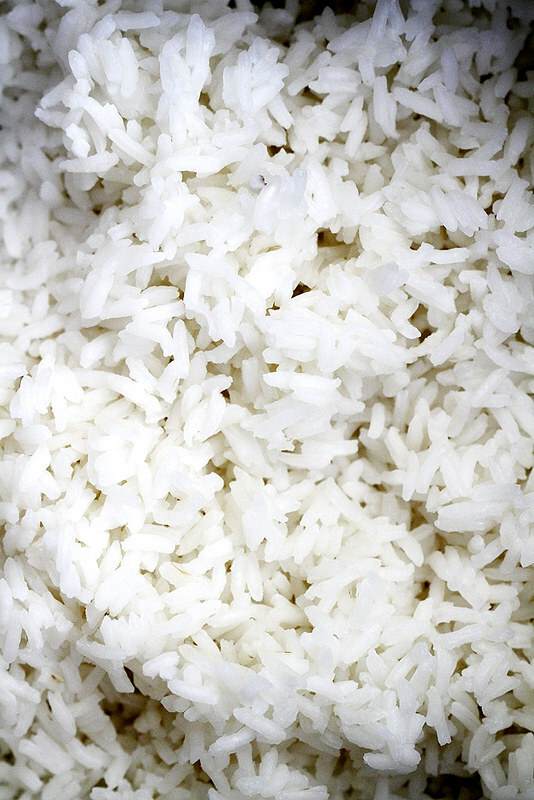 You add it to a bowl along with warm, fluffy rice and tender, flavorful Bob’s Red Mill Orca beans (named as such because of their beautiful black-and-white speckled appearance). Add a quick mango-bell pepper-scallion medley and drizzle on a lime vinaigrette and BAM — your bowl and your belly are ready. Though there are a few components to the bowls, they’re really easy to make and with a little prep, they can become your new favorite weeknight dinner. Serve them with extra lime juice and chopped scallions, warm or at room temperature, in your home or on a sunny Caribbean beach — whatever works for you. And if you have any extra Orca beans leftover to use up, I recommend adding them into a soup or a salad or eating them on their own tossed with a little extra lime vinaigrette. 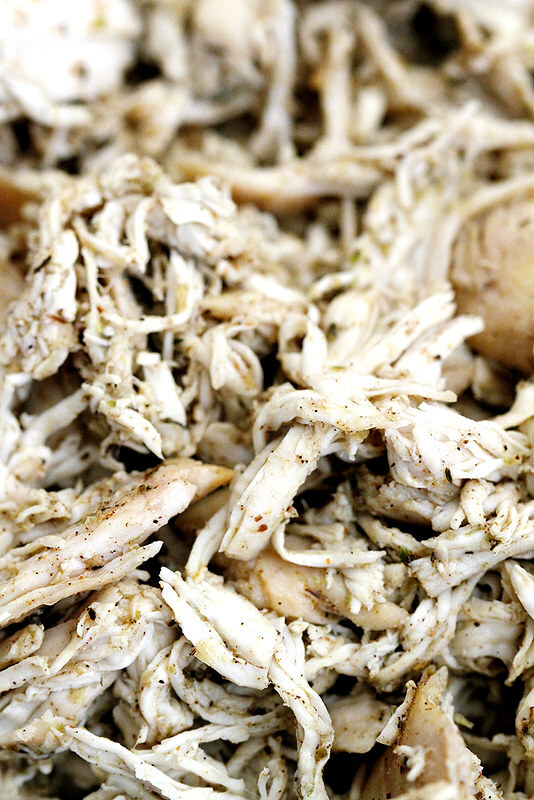 If you have any extra jerk chicken, you can do the same with it. And while it’s important to note that there are a myriad of options to use up the leftovers, don’t be surprised if you end up with none. One bite of this filling and flavorful dinner and you might find yourself consuming as much of this meal as I will be chicken/waffles/beer in a day out east. But seriously, if we can figure out a way to get this to transport us all to the beach, let’s make that happen, too. P.S. Do you have any recommendations for what we should do out in Asheville? Places to eat, things to do, etc. etc.? We are definitely hitting up the Biltmore Estate (duh) and probably this brewery, too, but any more ideas are most welcome! Kthanksbyyyyyye. 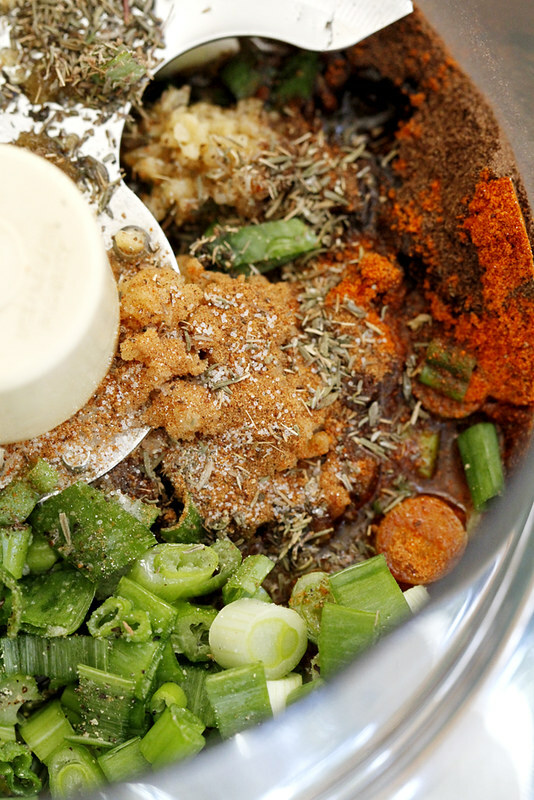 Prepare the chicken: In a food processor, puree scallions, garlic, brown sugar, allspice, thyme, salt, cayenne pepper, nutmeg, pepper, oil and vinegar until smooth. Place chicken breasts in a shallow dish and pour marinade evenly on top. Cover and refrigerate 4 hours or overnight. Heat oven to 400 degrees F. Line a rimmed baking sheet with foil and spray with cooking spray. Transfer chicken to prepared baking sheet and bake 20 minutes until cooked through. Use two forks to shred chicken. 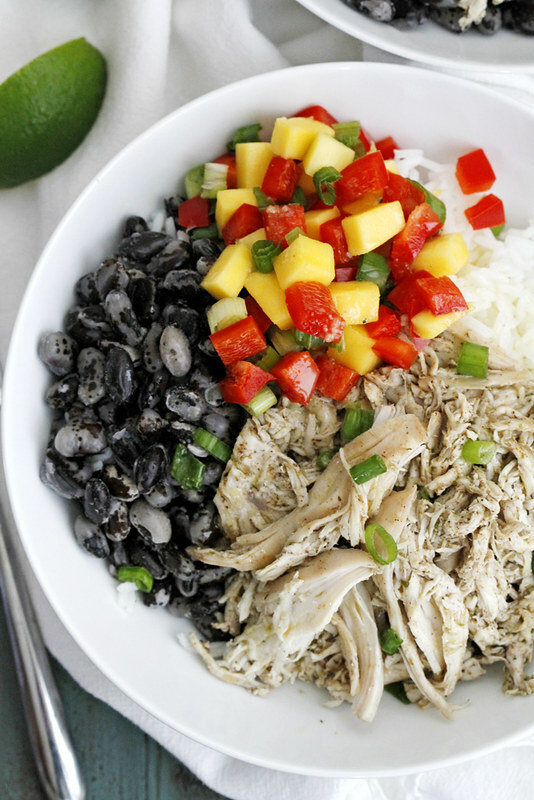 Prepare bowls: Divide beans, rice and chicken among 4 bowls. In a small, bowl, toss mango and bell pepper to combine. Divide evenly among bowls. Top bowls with chopped scallions. In a resealable jar, combine ingredients for lime vinaigrette and shake vigorously. Pour vinaigrette over bowls. Serve with lime wedges. This is the perfect monday night meal! Love it! If food came with a teleportation device, that would be just magical! You’re going to have soooo much fun in Asheville! It’s so pretty! It’s been a long time since I’ve been there, but I recall a really cool hippy coffee shop…but there are lots of those there! Hope to see some pictures on FB or GvD? Looks great! I have a question, though–is it just 1/4 teaspoon of vinegar for the marinade? Enjoy your time in Asheville. We’ll want pictures and description! These bowls sound delicious! If food could transport us to its place of origin, I’d likely live off of a rotation of margaritas + tacos, pasta/pizza + wine (the real good Italian stuff, obvi), thai food, and hot dogs (channeling NYC here). Now that would be a delicious (and fun) life. Whoa, this looks seriously amazing! 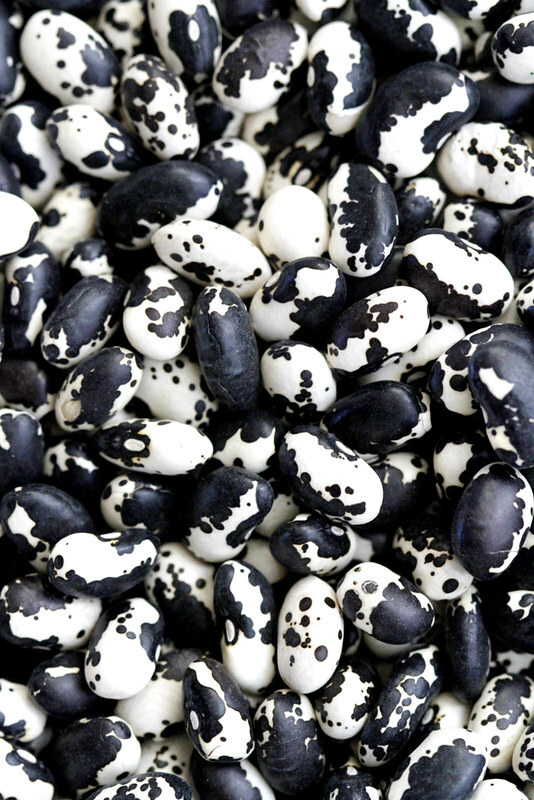 I’ve never seen or heard of Orca beans before, but they look *so cool*. My boyfriend has been wanting Jamaican food for a while, so I should definitely give this a try. Thanks for sharing the recipe, and please eat ALL the chicken and waffles for us!! Ashley — I am all about that kind of Mexican food. 🙂 Thanks! This is right up my alley! Yum! I’m guessing the chicken can be cooked in a slow cooker too? Love Asheville! So many great places to eat! I hope you have a great trip! You guys are going to have a blast!! I’m a little jelly:) But I think making this jerk chicken will cure my wanderlust! To travel the world bite by bite; too bad that isn’t a real thing. I saw this in my Pinterest feed and knew I had to stop by. Those spices! Girl, this looks delicious. I am completely on board with the things in bowls trend. This looks lovely. Wow this looks SO SO good! I just started back to work this week and I can see this being a great and healthy mid day pick me up for lunch! TY TY again Stefanie! Have oodles of fun in Asheville! Looks awesome! 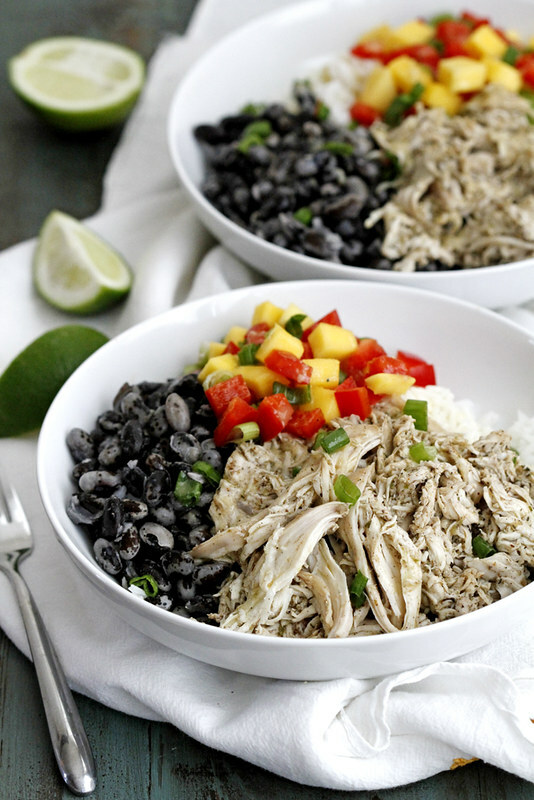 I never had caribbean jerk chicken, bean + rice bowls… but the way you put all the ingredients together makes me try it! Thanks! We just got back from Asheville (stayed in lake toxaway but went to Asheville for a few days). New Belgium brewery is AWESOME! So awesome we went twice lol! Also we loved Rhubarb for dinner. White duck taco shop is also fantastic. Have a wonderful time! Love your recipes! Also shout out to your PA hubby! I’m a hematology/oncology PA ??? ?